ENC28J60 Ethernet Module utilizes the new Microchip ENC28J60 Stand-Alone Ethernet Controller IC featuring a host of features to handle most of the network protocol requirements. This Ethernet LAN module connects directly to most microcontrollers. 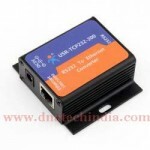 USR-TCP232-T Serial UART To Ethernet ModuleWant to interface your microcontroller directly via ..
USR-TCP232-200 Serial RS232 to TCP/IP Ethernet ConverterWant to interface your microcontroller based..